The prince of Denmark, son of Gertrude, nephew of Claudius, and heir to the throne. Hamlet is a deep thinker, focusing on impossible to answer questions about religion, death, truth, reality, and the motivations of others. He even obsessively contemplates the fact that he obsessively contemplates. He loves Ophelia and his mother, but his mother's marriage to Claudius makes him mistrust and even hate all women. He detests all forms of deception, yet plots and pretends to be insane. At times he even seems to be insane. Despite his obsessive thinking, he can act impulsively, as when he kills Polonius. Hamlet is an enigma, a man so complex even he doesn't completely know himself. In other words, he seems like a real person—which has made Hamlet the most well known character in English literature. Get thee to a nunnery: why wouldst thou be a breeder of sinners? I am myself indifferent honest; but yet I could accuse me of such things that it were better my mother had not borne me. Why, look you now, how unworthy a thing you make of me. You would play upon me; you would seem to know my stops; you would pluck out the heart of my mystery ... 'Sblood, do you think I am easier to be played on than a pipe? Call me what instrument you will, though you can fret me, you cannot play upon me. Alas! poor Yorick. I knew him, Horatio; a fellow of infinite jest.... Where be your gibes now? your gambols? your songs? your flashes of merriment, that were wont to set the table on a roar? The timeline below shows where the character Hamlet appears in Hamlet. The colored dots and icons indicate which themes are associated with that appearance. Florman, Ben. "Hamlet Characters: Hamlet." LitCharts. LitCharts LLC, 22 Jul 2013. Web. 20 Apr 2019. Florman, Ben. 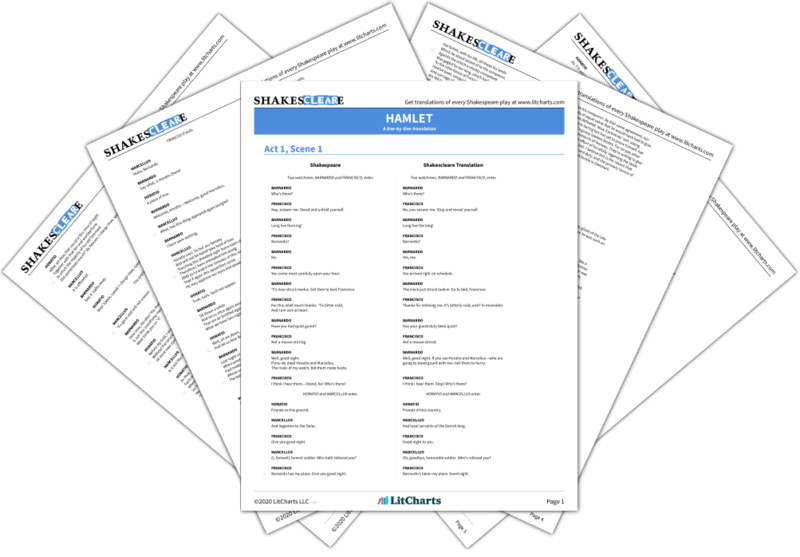 "Hamlet Characters: Hamlet." LitCharts LLC, July 22, 2013. 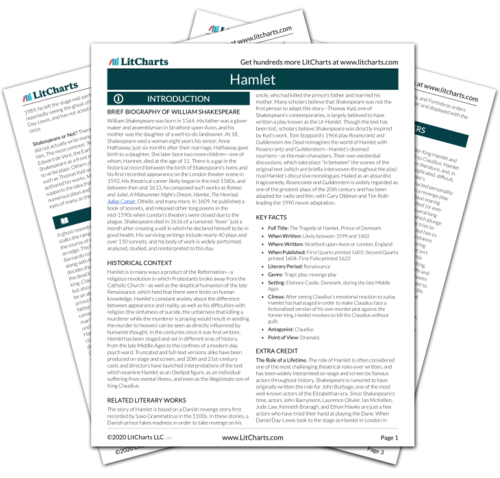 Retrieved April 20, 2019. https://www.litcharts.com/lit/hamlet/characters/hamlet.